The tools come sharp and ready to use. To keep them sharp I’ve created a simple sharpening guide to duplicate the way I grind each tool. Let it be known I have NO financial interest or received anything from Oneway, this is my opinon. I would like to thank them for permission to photograph the Vari-Grind attachment so this guide could be created. The Oneway Wolverine Grinding Jig with the Vari-Grind attachment is the best sharpening system on the market and all the gouges will be sharpened with this system. If you don’t own one go to www.oneway.on.ca or your favorite catalog and purchase one. Why? Because it works! If you own a Vari-Grind print out the guide, place your jig on the full size picture to set the angle, extend the tool 1-3/4 inches out from the jig, now set the nose angle on the wheel. It’s that easy. 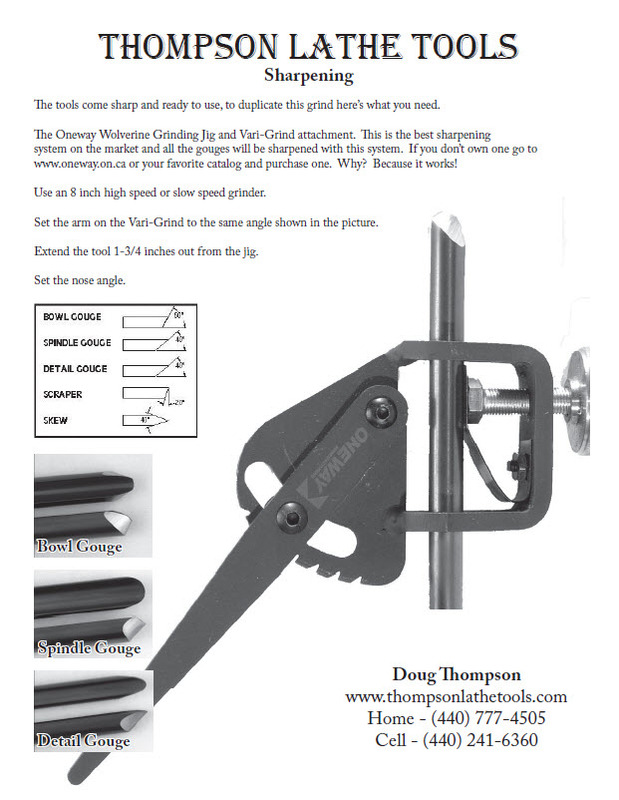 Download and PRINT the SHARPENING GUIDE in the Adobe Acrobat PDF file below.